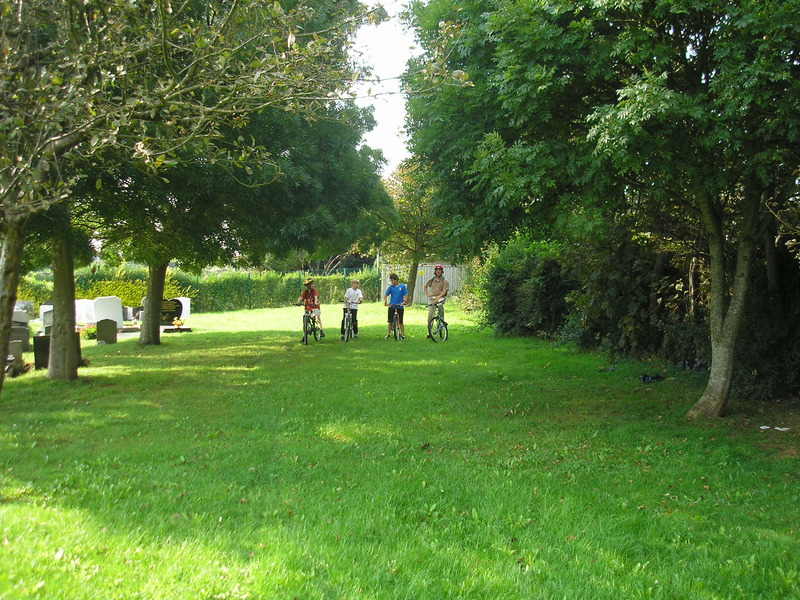 Rudi leads the way towards Knoll Park Recreation Ground, following the route of the old track, now coolly shaded by trees. 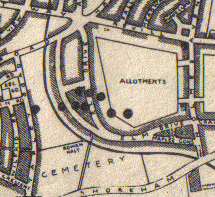 This part of the cemetery, north of the Old Shoreham Road, was previously Sackville Nursery. 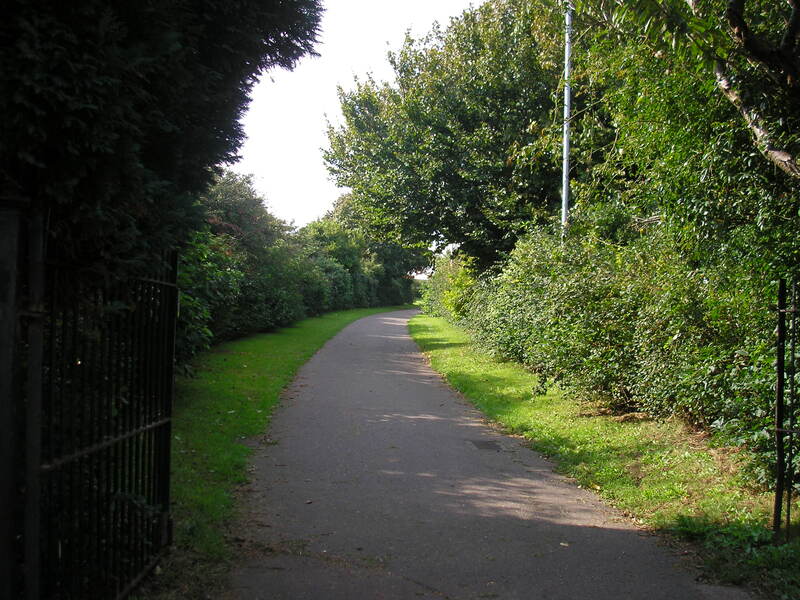 The boys follow the curved path at the back of Rowan Avenue into the park. 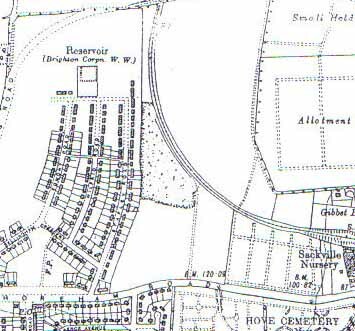 There are no signs on the old map to indicate that there had once been a small station, “Rowan Halt” at the back of Rowan Avenue! There’s sound reason for this; the halt was not built until after publication of the old map! The Aldrington Manor Estate, centred around Elm Drive and Rowan Avenue was built by T. J. Braybon & Son of Brighton in the early 1930’s. 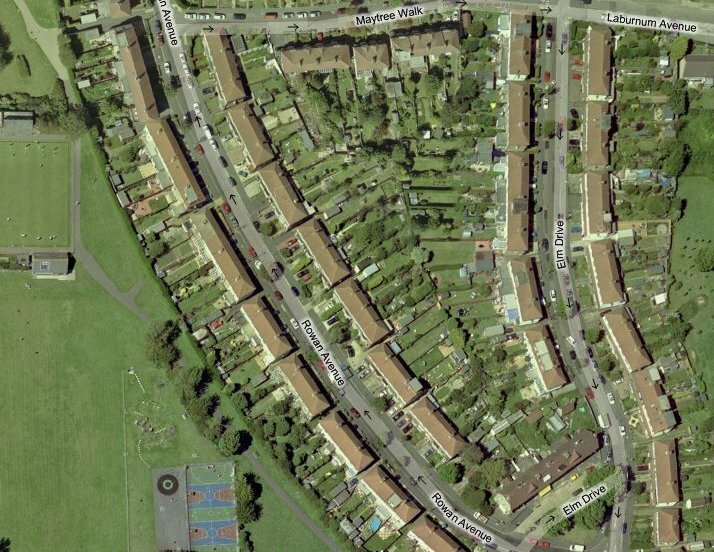 The estate rapidly developed and by 1934 250 houses had been built, with a further 100 planned. To serve the transport needs of the public, Rowan Halt was opened in January 1934. This consisted of a wooden platform, some 70 feet long, a corrugated steel shelter and footbridge across the line. It was felt that Southern Railway had shown great foresight in providing an outstanding facility to serve the transport needs of the area, just how wrong could they be, with the line closing just 5 years later! Tiarnan downloads the virtual view and they all compare it against the old map. The gentle curve of the old line on the map corresponds exactly with the virtual curved alignment of the back gardens of Rowan Avenue. Tom spots 2 twittens on the virtual view, these once gave access to the platform from Rowan Avenue. 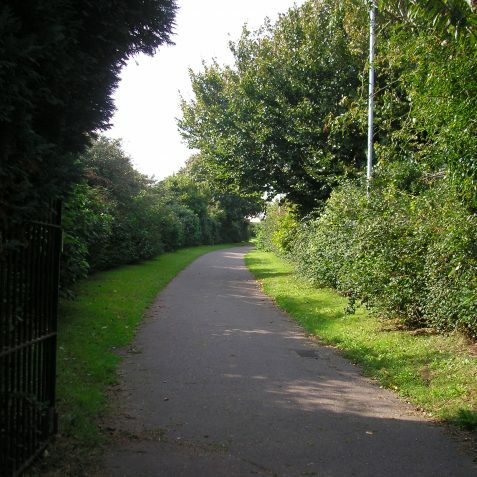 The old Dyke Railway line had not been closed for very long before the outbreak of WWII. Throughout the summer of 1940 the Battle of Britain was fought in the skies over southern England. On August 26th 1940, during a raid on the town, 9 bombs were dropped on the Rowan Avenue area. The old Dyke Railway would have been a legitimate target, or perhaps it was mistaken for the main London to Brighton line. A significant amount of damage was caused to houses in Elm Drive and Rowan Avenue, where 8 of the bombs fell. The 9th landed in Stapley Road killing poor old Mrs Mary Munro, whose body was dug out of the rubble some hours after the raid. 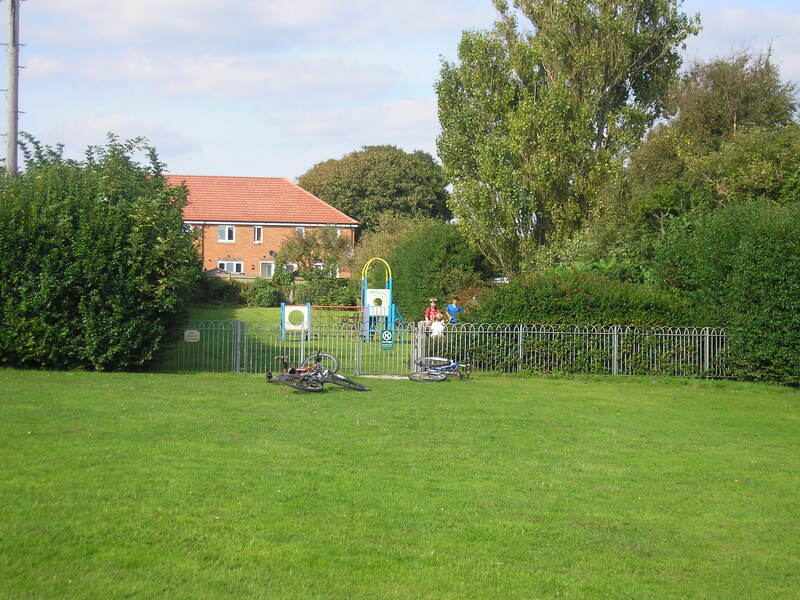 Knoll Park Recreation Ground was built on the site of a former refuse tip known as Hudsons’s Tip. 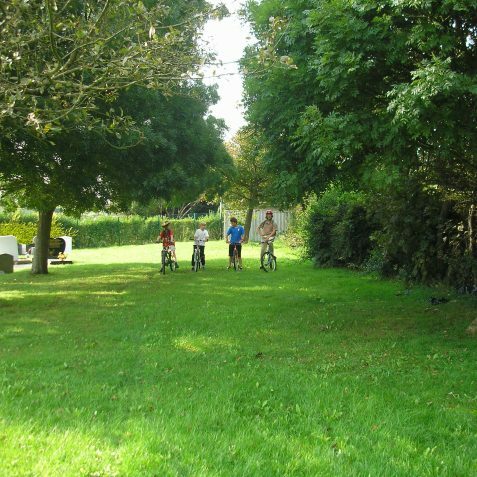 The boys stop to take a drink and watch the Hangleton Lawn Bowling Club in action before cycling up through the park to the children’s playground. 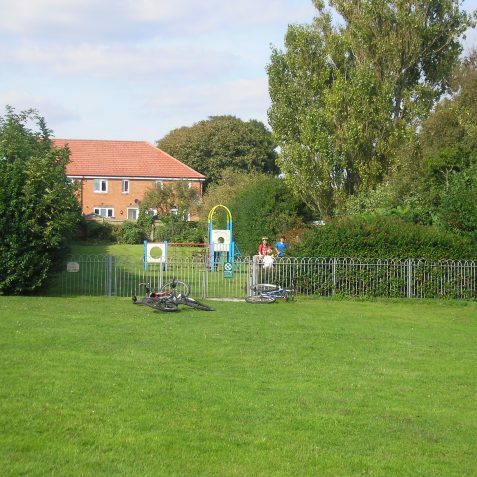 The 3 youngsters can’t resist 5 minutes on the swings and climbing frame, while Pete and Tony examine “Poppies At The Park” nursery, a 1950’s building constructed directly on top of the old Dyke Railway. Hi when I was young and living in Maple Gardens the buildings in this picture were in use as the kitchens for the Hove school meals service. The meals were then delivered to all local schools by vans. 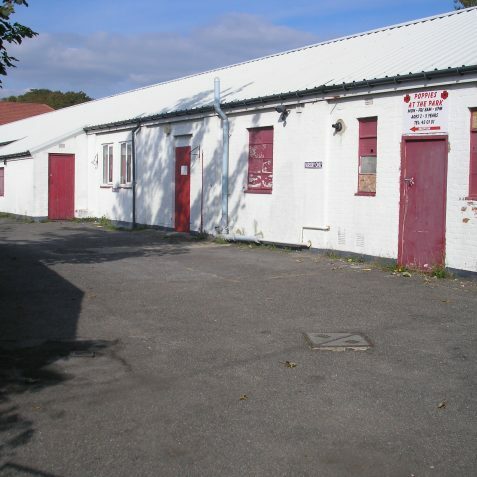 The vans were stored over night and serviced by Vine & Lee Garage in Station Road Portslade. On leaving school I became an apprentice mechanic there. I have just read the coments above about Poppies At The Park. 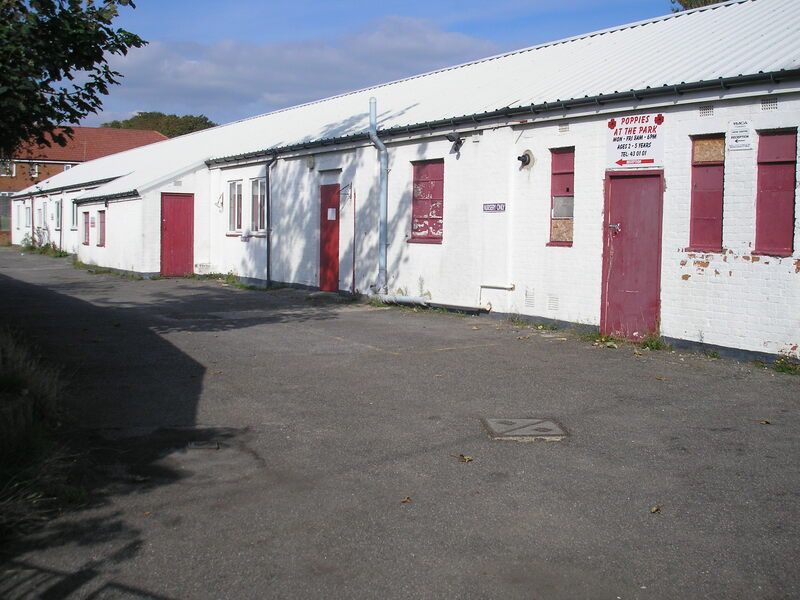 The building they are in, until about 1970 not sure of the date, used to be the school meals kitchens. All the meals for local schools were cooked there, and taken around to the schools in three green LD 30cwt vans. As an apprentice at Vine and Lees garage from 1966 I helped to service those vans. I can remember in the late 1960s, at this time of the year, one of my first jobs in the mornings was to fit snow chains to the vans to enable them to deliver the meals on time. 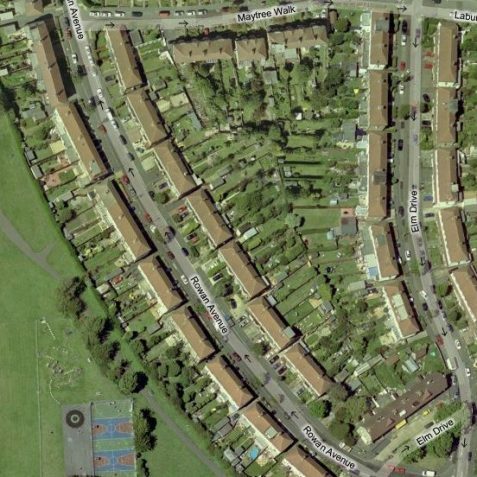 I grew up in various houses in Rowan Avenue and Hangleton Road , including no.187 which is almost on the spot where the railway bridge crossed Hangleton Road. I only recently discovered the James Gray collections online and they have some great photos of the line , however I have always wondered why so few good photos exist of parts of the line, in particular Rowan Halt (Peter A Harding’s booklet has press photos of the opening ceremony in 1934, but they are not very clear). Surely the railway was interesting enough to be photographed in the 1930s when many people were moving into the new houses in the area? Also I should think enough people who could afford a property would have had a camera – I am sure there are many pictures out there that are long forgotten of the line (and its even possible that there maybe old cine films of the line in action tucked away somewhere). I completely agree with Calvin’s comments about the apparent lack of photos of certain parts of the Dyke line. Whilst the fairly early demise of the line might account in part for this, what I have always found puzzling is that railways in general tend to be well covered by photographers and it is therefore strange that parts of the Dyke line appears to be an exception. Incidentally, the last time I visited the site of Rowan Halt I noticed some sheets of faded green corrugated iron tucked hidden away behind the bushes. Could this be part of the old station building structure which would once have stood on the site? Hello Stu, am I right in thinking that you are the Mr S Berry credited at the back of Peter Harding’s booklet? It’s a very good account, probably as complete as we can get. I have been in touch with Peter (Groves ) and although I now live in Yorkshire I would like for a few of us to meet and explore parts of the line, maybe in the Spring? I am especially interested in the town end of the line as it maybe there is still something to find (as you say about Rowan Halt). 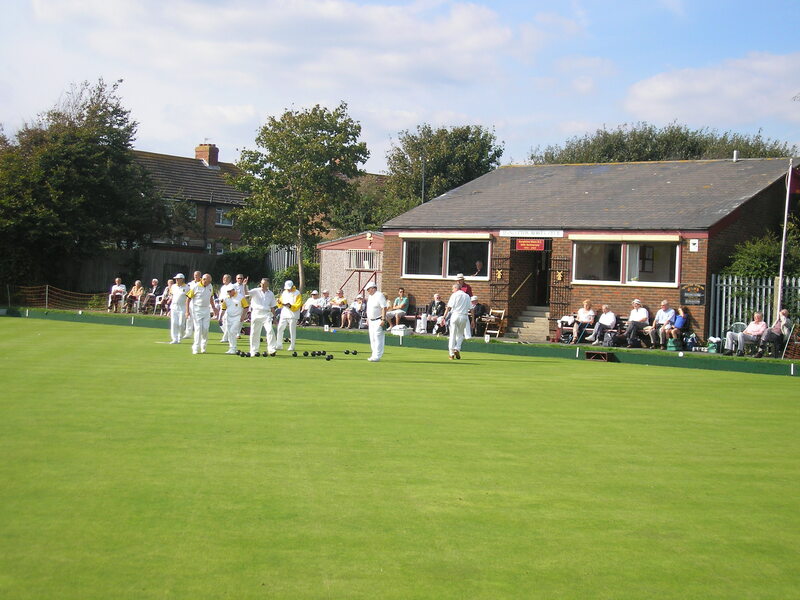 Anyone interested in meeting or exchanging info can contact me at calvinandabeer@yahoo.co.uk. Has anyone managed to find more photos of Rowan Halt? I would be very interested, as I grew up near there and I never knew it existed until a year or two ago. That station would have made my life a lot easier. I’m also baffled and annoyed about the lack of images. Lydia, I’ve not come across any more photos of Rowan Halt, there seems to be very little available. 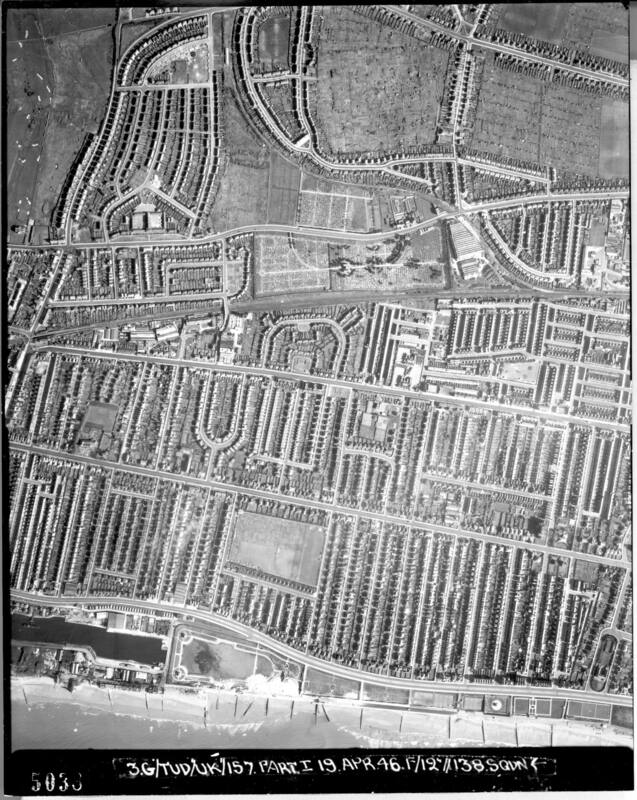 One good site to look at is https://www.sussex.ac.uk/geography/researchprojects/sussexairphotos/1940/18-5038.jpg It shows aerial photos of Brighton and Hove taken in 1946, you can zoom in and see where the station was, and other bits of interest. Also if you search on You Tube for the Dyke Railway, there is a great movie clip of the train as it approaches Rowan Ave area. Hello Peter! Hope you are well – nice to see that people are still dropping by as it’s a great posting. Lydia – I am ‘wilburystand’ on YouTube and we exchanged messages there about Rowan Halt. Unfortunately the video of the railway is no longer uploaded. Can I take the chance to update my contact details from above. 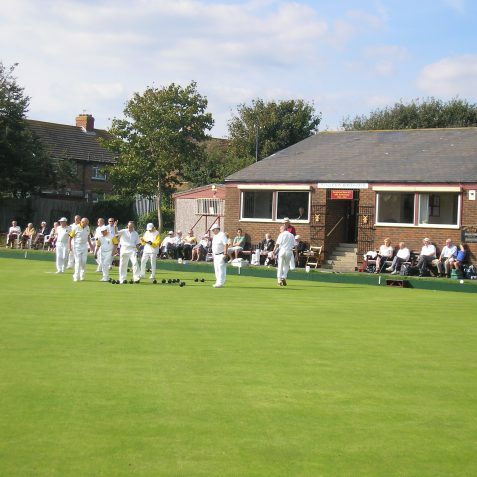 It is now calvinmarkpayne@inbox.com Nice to hear from anyone interested in meeting and walking the line again when the weather improves. Does anyone have any info on the cafe called ‘Dennetts Corner’ which was next to the Dyke Railway station? I am a decendent of the Dennetts who were, apparently, very big in Woodmancote. Thank you Peter, very much appreciated and well spotted.